Wincobank television transmitter is a low power repeater (only 2W) off Emley Moor which was constructed in 1977. The site is sandwiched between Barrow Rd and the railway line to Chapletown/Leeds which was originally built by the Midland Railway in 1894. Rather more recently than that, the M1 opened up to here in 1967, the next section north (from junction 34) had to wait until the following year. As expected for a relay Wincobank is vertically polarised and it is a C/D group for all its output. If one looks carefully one can see the Log periodic receiving aerial pointing at Emley Moor. Most relays use Logs as reception aerials if they have “line of sight” onto their main transmitter. Only MUXES 1 to 3 (the PSBs) are transmitted from Wincobank, not all six. location because this would also give co-channel from Waltham . 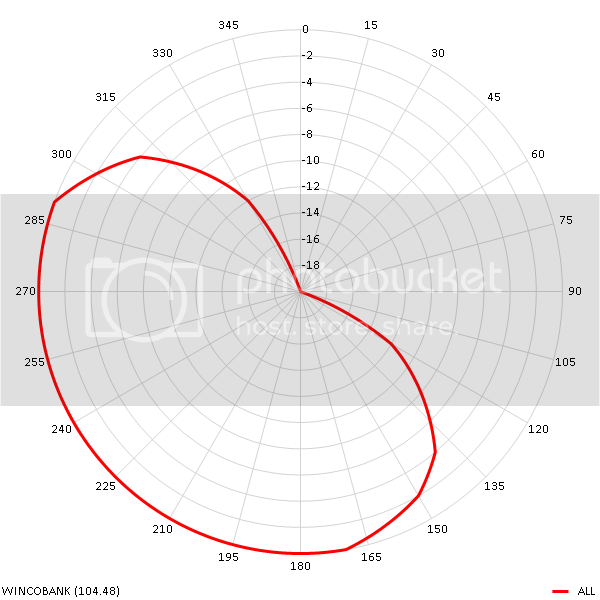 Click here for Wincobank transmitter`s radiation pattern. Wincobank transmitter from the South. The train is the 11.18 fast service from Sheffield to Leeds via Barnsley and Wakefield Kirgate. (30 March 2012). Wincobank transmitter`s Log Periodic array. The bottom (horizontally polarised) one receives the signal from Emley Moor, and the top pair (vertically polarised) retransmit into the valley. The transmitter is located just East of the M1, half a mile North of J34. and the bottom aerial (vertically polarised) retransmit`s it into the valley. Note the broadcast authorities use of Log Periodics, an aerial we recommend to use wherever possible. There is another small (2 Watt) repeater called Blackburn at OS Grid Ref SK 389 926. It`s just half a mile north of Wincobank transmitter (off Droppingwell Rd), but it isn`t used by many people at all. Just like Wincobank, it`s vertically polarised and is a C/D group off Emley Moor. Blackburn only transmits MUXES 1 to 3 (the PSBs), not all six. 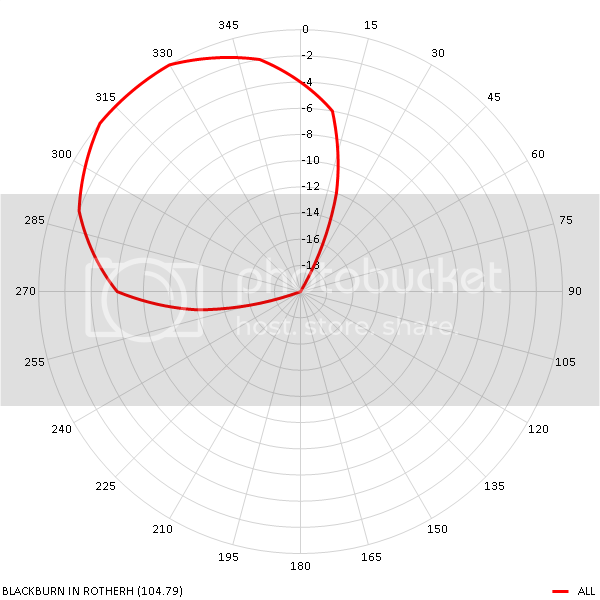 Click here for Blackburn transmitter`s radiation pattern.